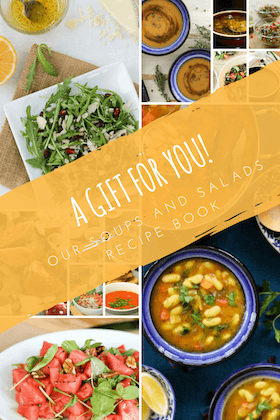 A blast of colourful raw vegetables and a simple salad dressing, come together in this tasty and nourishing vegetable salad bowl. 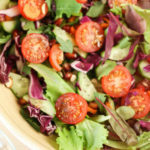 Gluten free and vegan, this salad will make a great side to any meal but I devour this beautiful rainbow for a full meal. Since there is no cooking involved, it takes just about 10 minutes to chop all the salad vegetables and put it together. The vegan salad dressing is the easiest – just shake everything together in a jar or whisk in a bowl. This colourful salad is like eating a rainbow. 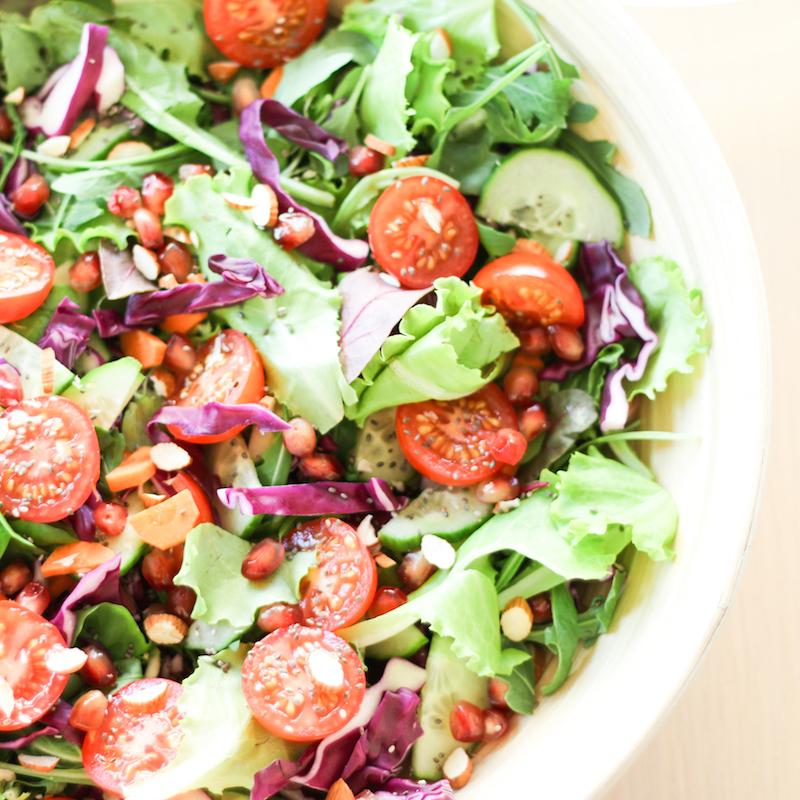 The different salad vegetables not only bring in colours but also a lot of different types of vitamins and minerals. Plus there is lots of water and healthy fibre content. The greens are great detoxifying vegetables, the purples are rich in anti-oxidants, the reds promote blood circulation, the orange fights cancer and the whites promote heart health. 1 juicy fruit (like orange, grape or pomegranate). A light salad seasoning with lemon, salt and pepper is usually enough. For more flavour, this time I made a salad dressing with olive oil and maple syrup. Fruits especially Pomegranate seeds add a shot of juicy surprise in the bite. loosely spread around the purple cabbage, cucumber and the cherry tomatoes (with their seed side facing up for a beautiful look!). To make the salad dressing, add all the ingredients in a jar and shake-shake-shake. Just like that! 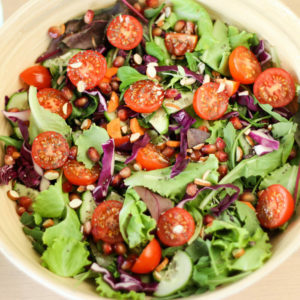 This salad is rich in vitamins, minerals and antioxidants. You can bump up the protein content by adding some sprouts and/or tofu for vegan salad and/or cottage cheese for vegetable salad. Raw food has plenty of digestive enzymes (which cooked food lacks) that aid the digestive system. On top of that it is easily broken down. We try that at least 40% of our meal is raw food including both fruits and vegetables. For both of us, it has worked wonders for our digestive systems and overall health. Last week when we got back from Austria, there were quite a few indulgences as is expected on a holiday. 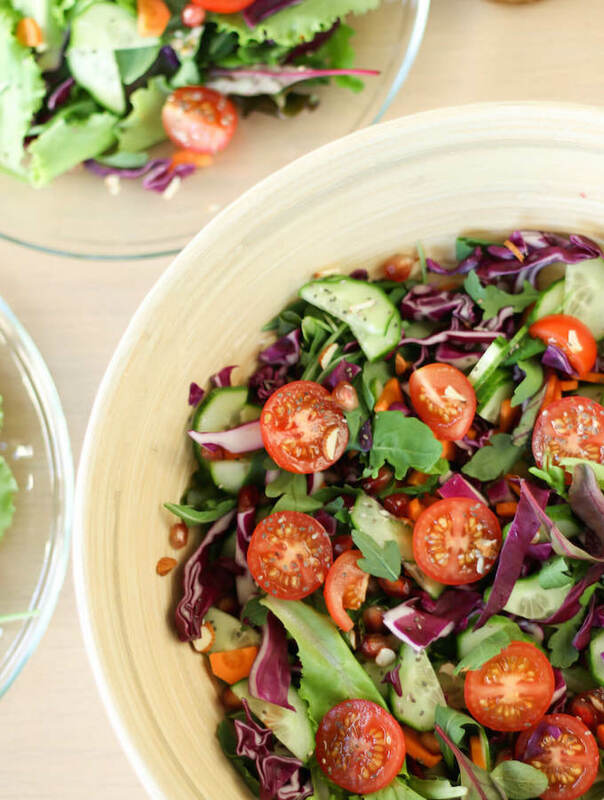 This raw salad was the perfect detox meal that our bodies were craving for. Make a rainbow vegetable salad with different salad vegetables and send me a picture, leave a comment or connect with me on Facebook, Twitter, Google+, Pinterest and Instagram. Would love to start a conversation, share recipes, cooking experiences and food stories from India and around the world.